In Part 1 of Strength Training we discovered how little attention is paid to the health of your endothelial cells and their importance to athletic performance. In Part 2 we learned how the endothelial cells create capillary beds to improve circulation. We also learned that your endothelial cells create nitric oxide which is critical to blood flow. In this concluding part we are going to put it all together so that you can completely understand how this impacts your training, performance, and recovery in strength training. We’re also going to look at the two critical amino acids needed by your endothelial cells. One you’ve most likely heard of but the other one is seldom talked about or used, yet it can make a significant difference in all phases of human performance. Training for Muscular Strength and Endurance! There are many different training programs designed to help you build strength, stamina, speed, endurance, and power specific to your strength training goals. Foundational to every strength training program is your ability to fuel muscle tissues with the oxygen and nutrients they need to sustain your efforts. It also becomes the limiting factor in your athletic performance because of the difference between anaerobic and aerobic energy production and the waste products they produce. In the simplest of terms, 1 unit of glucose will produce 2 units of energy during anaerobic respiration and the resulting waste product is lactic acid. In aerobic respiration 1 unit of glucose will produce 36 units of energy and the resulting waste products are carbon dioxide and water. Aerobic respiration produces 18 times more energy and its waste products do not negatively affect muscle contraction like lactic acid does. Yet, the waste product of carbon dioxide enhances the lungs ability to saturate the hemoglobin molecules of the red blood cells with oxygen. With enhanced circulation, that comes from properly repairing and fueling your endothelial cells to optimize their production of nitric oxide, you are able to keep this ideal metabolic exchange for a longer period of time. By properly nourishing your endothelial cells you will help them increase capillary beds to the working muscles, tissues, and organs involved in your strength training program. This will increase their ability to produce nitric oxide, the master signaling molecule of your cardiovascular system. These two factors will improve blood flow and deliver more oxygen and nutrients to the working muscles. This will allow them to work at a higher aerobic capacity for a longer period of time. This will allow you to work at a higher intensity with less lactic acid formation for quicker recoveries so that subsequent strength training sets can be performed at a higher intensity with less lactic acid buildup. This improves your anaerobic threshold, which is the limiting factor for most people. Improved blood flow results in improved performance of the working muscles, faster recovery, and better muscle development to maximize your strength training program. 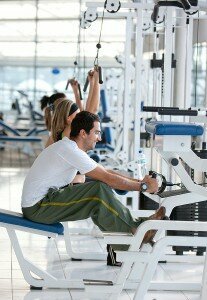 This applies to both general fitness and specific muscular development for your particular sport. While there are many factors that can affect your performance, most athletic ability is a product of your training and the ability to properly fuel your body to meet the demands of your event. Just like in training, properly nourishing your endothelial cells to improve their ability to properly produce nitric oxide can make a significant difference in your athletic performance. Critical to your performance will be your body’s ability to deliver needed oxygen and nutrients to meet the intensity of your event, and to sustain that intensity for as long as needed. By optimizing the health of your endothelial cells you will help improve circulation. Improved circulation improves the delivery of needed oxygen and nutrients while carrying away the waste products that can be a limiting factor in performance. Again, you have significantly improved your anaerobic threshold, which is usually the limiting factor for most people in strength training and affects everyone’s performance. Just as the endothelial cells, and their ability to properly produce nitric oxide, improve both training and performance, they will also have a positive effect on recovery. Recovery is a combination of waste product removal and reloading the muscle tissues with the nutrients they need for repair and energy production. Again, this is a function of improved circulation. When your endothelial cells properly produce nitric oxide for improved circulation, you work at a higher anaerobic threshold, which means less lactic acid production. With improved circulation it’s easier to remove this limiting waste product to speed recovery. Improved circulation also delivers the needed nutrients to reload the muscle tissue and facilitate any tissue repair. All of this means quicker recovery from both your strength training and performance activities. Two Critical Amino Acids for Strength Training! There are two amino acids that are critical to properly nourishing and repairing your endothelial cells to optimize their ability to produce nitric oxide. They are L-arginine and L-citrulline. Many have heard of L-arginine since there is a wealth of information and products in the marketplace. Few have heard of L-citrulline yet it is just as important to the health of your endothelial cells as L-arginine. Precursor for the synthesis of nitric oxide. Stimulates growth hormone, which is essential for large muscle mass, multi joint exercises, as well as high power exercises. Improves blood circulation and aids in blood pressure regulation. Improves insulin sensitivity to help normalize blood sugar and replenish post workout glycogen stores. Your endothelial cells use L-arginine to create nitric oxide. Most research indicates that for you to receive a therapeutic effect you need to consume at least 5 grams of pharmaceutical grade L-arginine. This means both the quantity and quality of L-arginine used is extremely important. The amino acid L-citrulline is very hard to obtain from food alone so supplementation is the best option. Most vascular researchers will tell you that L-citrulline is equally important, maybe even more important, than L-arginine because it significantly extends the ability of the endothelial cells to properly produce nitric oxide. Typically, a therapeutic level of L-arginine creates a 30 minute to 2 hour window of improved nitric oxide production. By including the proper amount of L-citrulline you can extend this improved nitric oxide production to 24 to 36 hours. This extended window of improved nitric oxide production allows for significant health benefits. This helps to repair the endothelial cells so that they can work optimally. This provides improved blood flow so that muscles, tissues, and organs that have been used during all phases of strength training can recover quicker for better results. Additionally, L-citrulline can bypass the destructive nature of the enzyme arginase that everyone carries in their blood stream. Arginase destroys L-arginine, which can limit nitric oxide production. L-citrulline provides an alternative pathway for the endothelial cells to convert L-citrulline to L-arginine for improved nitric oxide production. This is especially important for African Americans since they have a genetic predisposition for carrying higher levels of arginase in their bloodstream. Unfortunately, most L-arginine products sold as nitric oxide enhancers do not include this critical amino acid L-citrulline. ProArgi-9 Plus for Strength Training! ProArgi-9 Plus is a clinically proven, natural, nutritional supplement that is uniquely designed to repair the endothelial cells that line all of your cardiovascular system to improve their ability to create nitric oxide. This product was originally designed for clinical use for those with cardiovascular health issues. It has both long term and short term clinical results. 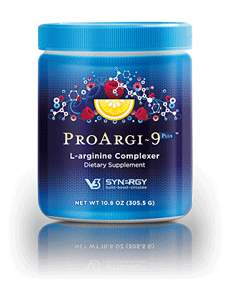 Results that have clearly demonstrated ProArgi-9 Plus‘ ability to remarkably improve the health of the endothelial cells and enhance their ability to create nitric oxide. This has resulted in dramatically improving circulation and eliminating or substantially reducing cardiovascular challenges. As this product has been applied to strength training it has produced remarkable improvements for athletes. Improved training, improved performance, and improved recovery have all been noted by those who have made ProArgi-9 Plus a part of their nutritional program. Most athletes will take 1 ½ to 2 scoops of ProArgi-9 Plus approximately 30 minutes prior to their workout or performance. By the time they have completed their warm up it’s in their system to help provide their endothelial cells with the necessary ingredients for improved nitric oxide production. It then significantly enhances their ability to work at higher intensity levels with less lactic acid formation for quicker recoveries. Because ProArgi-9 Plus includes L-citrulline it helps to enhance the body’s ability to repair so that recovery is quicker. This overall improvement in training, performance, and recovery has helped those who strength train see significant gains in the gym and during their athletic performance. This Nobel Prize winning information in the area of anatomy, biochemistry, and nutrition has produced documented clinical results for improved cardiovascular health. This same information can also be applied to strength training to enhance all phases of your athletic performance. This entry was posted in Athletic Performance, Endothelial Cells, Nitric Oxide, ProArgi-9 Plus and tagged Aerobic Respiration, Amino Acids, Anaerobic Respiration, Athletic Performance, Capillary Beds, Carbon Dioxide, Circula, Critical Factor, Endothelial Cells, Energy Production, Hemoglobin Molecules, Human Performance, Limiting Factor, Muscle Contraction, Muscle Tissues, Muscular Strength And Endurance, Nitric Oxide, Performance Training, ProArgi-9 Plus, Red Blood Cells, Speed Endurance, Strength Training, Strength Training Program, Units Of Energy by Dan Hammer. Bookmark the permalink.